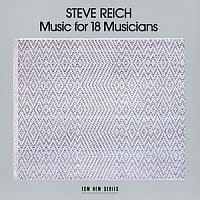 Composed between 1974 and 1976, it was immediately recorded for the ECM label -- a slab of vinyl I have listened to often. Though I haven't heard all the subsequent attempts, the original ensemble is definitive. They fully express the subtle development of the piece and encourage the shifting of listener attention from the regular mechanical pulse to the rhythms of human breathing that overlay it. The influence of Balinese Gamelan is apparent, but this is a unique work of distinctive vision. And a piece of musical history you can own for a song.